Bore sighting naturally comes next after installing a scope on your rifle. It is a method of adjusting sight alignment with the axis of the bore. There are multiple types of bore sighter (or boresighter) in the market with the laser type being the latest ones. In this article, we listed out the best laser bore sighter and how to pick them meticulously, so that sighting in a rifle won’t be a waste of your ammunition. We identify in this article the best laser bore sighter which comply with the checklist we’ve enumerated. They are currently best sellers on the market, and you should check them out before checking on other product models. Though it belongs to the more expensive bore sighter, it’s packed with features which will make you think that you’ve made a good purchase. This one is not only limited to red laser beams, but it also has a green laser variation. Unlike other laser bore sighters, this one doesn’t need to be inserted into the rifle’s muzzle. There’s a magnet integrated on its back so that it would attach to the rifle’s barrel. 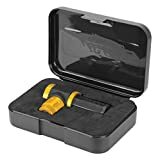 It features a high-strength magnetic connection which makes it very versatile. You can attach it to any firearm you want to use because there’s no need of worrying about the caliber anymore. The body construction of Wheeler’s bore sighter is said to be durable because of the aluminum material. The laser module isn’t housed in the aluminum. Instead, Wheeler uses a soft rubber over-molding. The bore sighter is already calibrated upon purchase. It was hand-tuned by a set of screws before an epoxy was injected into the void space permanently around the laser module. Setting it up is an easy feat and can be done in seconds. Just place the magnet carefully against the edge of the muzzle and rock it over onto the muzzle face. 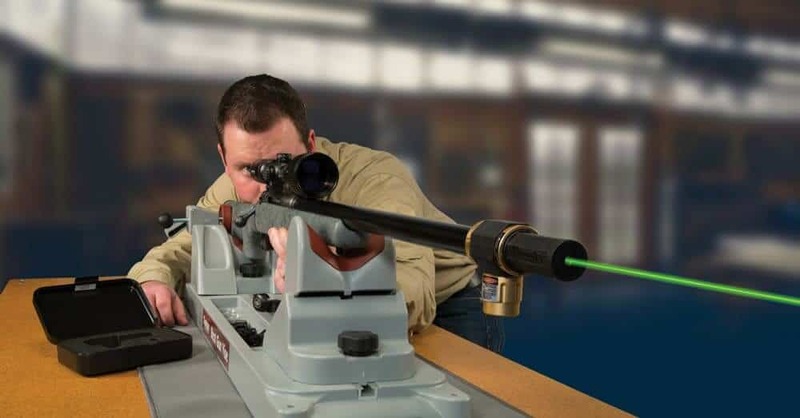 The recommended reference point when you sight a scope with Wheeler’s bore sighter is at 25 yards. This is done so that accuracy is guaranteed even if it emits a red laser beam. Remember that the target must be reflective so that the dot would appear. To sight the scope, measure the vertical distance between the center of the sight to the center of the barrel’s bore. Normally it’s around 1.5-2 inches for optical sights and 0.75 inches for iron sights. So for instance, if the vertical distance is 1.5 inches then adjust the reticles so that it’s aimed 0.75 inches above the laser dot. The product is good overall with minimal setbacks. The power button switch might be finicky wherein you have to tap it a few times to make it work. However, this is just a case to case scenario. The Wheeler’s bore sighter is powered by one lithium battery and is already included in the package. The package also includes a plastic case for storage when the product is not in use. If you’re looking for a bore sighter that can sight scopes starting at 15 yards to as far as 100 yards, this one might be for you. Moreover, if you’re more of a red laser beam fan and aim to buy at a lower price range, Sightmark bore sighters might be your best bet. Purchasing Sightmark bore sighter can be a little tricky because there are a lot of them and only differentiated by the caliber size. Be sure to get the right one, so there won’t be any hassles later on. This bore sighter is unlike others where you have to insert it to a rifle’s muzzle. Instead, they fit into the chamber, so there’s consistent alignment with the gun’s bore. Sightmark boresighters are easy to use, and you can get the scope’s crosshairs to the center of the dot in no time. Since it doesn’t come in green lasers, some of you may observe that red lasers aren’t good in visibility when it’s still daylight. With Sightmark bore sighter, the laser dot is visible at 100 yards, and it measures about 2 inches. As for its material construction, the body is made of brass which adds to the overall aesthetics of the product. It might even pass off as an expensive laser bore sighter. AG3 batteries power this bore sighter. However, the product lasts for 1 hour which could be a bother if you are taking your time sighting your scope. Furthermore, AG3 batteries are quite hard to find which requires the buyer to buy battery packs to continue using it. Upon purchase, the Sightmark package includes a carrying case and batteries. If you’re a military fan, probably you would know about this bore sighter already. SiteLite offers a high-tech bore sighter that assures superior bore sighting accuracy with the help of a computer program. The ease of use and straightforward sighting are this bore sighter’s main strengths that you can’t afford to miss. 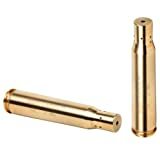 It fits certain lengths for both rifles and muzzleloaders through the adapters and O-rings: 22 to 50 caliber for rifles/handguns and 20 to 12 gauge for shotguns/muzzleloaders. SL-100 provides better accuracy than bullet-shaped bore sighters because of its adapters and O-rings which help stabilize its attachment to the barrel. It attaches to muzzle through the strong magnet, and no metal touches the rifling of the firearm. A program that is downloadable to your PC or smartphone tells you to input your rifle and ammo to create a custom laser bore sighting target. This is called Ballistic Targeting System. The bore sighter can sight scopes starting at 25 yards up to 300 yards. Another software program to aid you is the Alignment Verification System Reflective Target - letting you verify scope alignment in the field according to your recorded information. By the way, an SRL Scope Leveler is included in the package which levels the crosshairs before bore sighting. SL-100 projects a laser beam which is good at dark, but it has lesser visibility in daylight. However, since you can start sighting a scope at 25 yards, it should be still discernable by then. For a product that has excellent qualities, SL-100 has minimum setbacks. One thing is the battery life. Though its product information says that the bore sighter lasts up to almost 2 hours, it doesn’t seem to be that way. Also, beware about the button switch. It’s made out of plastic and could be a concern in the long run. Upon purchase, SL-100 includes a carrying case so you can store it in there when not in use. If you are more into handguns than rifles and want a proper sight alignment just for pistols, this handgun sight might appeal to you. This particular model is excellent in nighttime use but could still be functional in daytime. Night sights are typically tritium-filled which make them glow in the dark. This allows a proper sight alignment just for your gun to assure pinpointed accuracy. Together with the super bright optics that magnify brightness, TFX Pro can function without batteries. 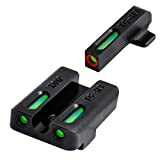 The unique U-notch design of the night sight improves front sight acquisition and is fitted at the end part of the gun. Between the U-notch, the part with an orange focus ring increases speed, accuracy, and target acquisition. However, there’s limited light access to the fiber optics which limits the conditions the night sight can work best. Also, the orange ring at the front is less visible in low light conditions since it’s not tritium. Its external construction made use of CNC-machined steel coated with rustproof Fortress Finish. The illuminating elements are housed in a capsule using TFO technology that is impervious to chemicals and shock. All of these give off a strong vibe that guarantees you a good investment. Bushnell is a powerhouse brand in regards to firearm equipment. Their Professional Bore sighter caters to .22 to .45 caliber bore sizes for many types of guns – either rifles, handguns, or muzzleloaders. Zeroing is good at 100 yards, and this bore sighter is capable of giving consistent results that save both time and ammo in the long run. Bushnell Professional comes with three expandable arbors that snugly fit the arbor’s locking nut. The first step is to insert the arbor into the bore sighter and screw it until it’s tight. Have the bore sighter in an upright position and push the other end of the arbor into the muzzle until it rests on the tapered section of the arbor. Look through the scope and the bore sighter’s vertical grid lines, align the scope accordingly. For each graduation at 100-yard distance, it’s equivalent to 4 inches. Bushnell Professional was originally designed for rifles using low to medium height sights. Modern rifles especially the AR model type have high mount scope rings. So, if you use this bore sighter, only the top of its grid would be visible in the scope. Bushnell Professional is sold by the package. The package contains the bore sighter, three arbors, and a carrying case. The bore in bore sighting was derived from an old method on how to sight rifles. Before, the method was to remove the bolt in bolt action rifles and look through the bore. About several yards away from the target, the rifle is propped without any movement. And then, the next step was to look through the scope. By then, adjusting the elevation and windage turrets were to make the reticle center at the bull’s eye of the target. This made zeroing faster. Sighting a scope with a laser bore sighter has made things simpler than before. Laser replaces the visual inspection with this device. Unlike the traditional bore sighter, you don’t need to remove the bolt, making it applicable to many types of firearm. Furthermore, the laser dot doesn’t move if you touch the gun a little. Laser bore sighting is done by simply placing it in the gun’s chamber and closing the action. The laser bore sighter emits laser from the barrel and projects onto the target. You then have to calibrate the scope against a target from a set distance, which is commonly 50 yards away. The thing about laser bore sighter is it requires a reflective target so that the laser beam would reflect. Then, adjust the scope’s crosshairs until they’re centered towards the laser’s dot. The main advantages of bore sighter are to save time and limit the ammo used to perfect the alignment of the reticles to the center. Also, you must be mindful that for every kind of ammo, there will be a different point of impact. 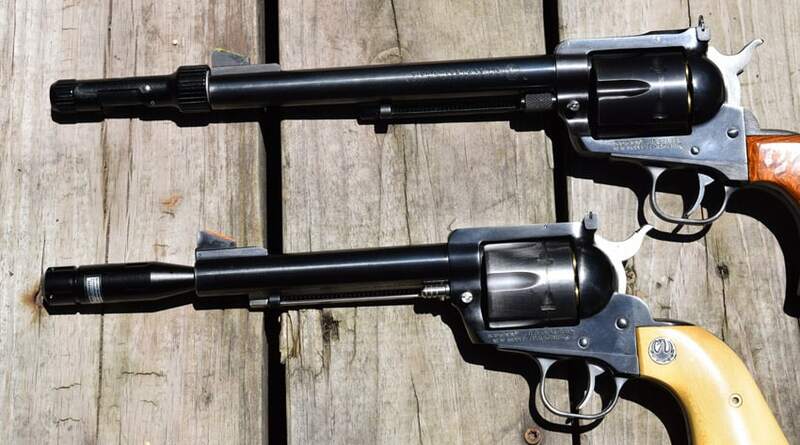 For beginners, know that the bore sighter must be removed from the chamber before you attempt any shooting. Yes, bore sighter are made so as to not waste ammo on perfecting the scope and laser bore sighter’ function is to project laser beams from inside the barrel. Some users who didn’t know better failed to take safety measures. It’s a common notion that more expensive products have more features in it that the cheaper stuff. This is not especially true in every case. One thing that you must exercise is to look for the features of a bore sighter that you think would be useful to you. Though it’s not uncommon, expensive bore sighter have irrelevant features that you’re not going to use anyway. The laser bore sighter you should choose based on performance is its versatility to fit in most gun barrels. The muzzles of different rifles vary in diameter size, so it’s a must that what you’re going to buy suits to the model of your firearm. Laser quality is about the intensity and color of the beam. The intensity of the laser is closely related with the battery life. On the other hand, the color of lasers commonly used are either red or green. Each of these colors has their pros and cons. Red lasers are most common, and they are relatively cheaper. They are also extremely visible in low light conditions. However, it’s the opposite effect when in daylight. Green lasers are the best alternatives if you’re going to use the laser bore sighter when the sun is up. It’s very visible up to medium distances. However, they are priced higher which makes the bore sighter more expensive. This is a major factor as laser bore sighter are powered by batteries. If the laser bore sighter has long battery life, then you won’t be bothered by warnings when you’re too busy sighting your scope. 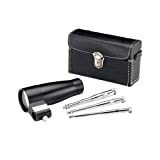 It’s recommended that you get a laser bore sighter that is made out of aluminum. Not only the material can resist impact from falling, but it also gives off a nice aesthetic. A durable bore sighter should also be weatherproof, so it lasts a long time. Using a bore sighter is the next big step after purchasing a scope. The laser bore sighter save you time and ammo when adjusting the scope’s crosshairs. There are factors to consider, and through our best laser bore sighter reviews, you now have an idea on what to look for if you consider other models.